Philadelphia is a huge city with several district articles containing sightseeing, restaurant, nightlife and accommodation listings — have a look at each of them. Philadelphia, located in Southeastern Pennsylvania, in the Mid-Atlantic region, is the fifth most-populous city in the United States. Often referred to as "Philly," the city is coterminous with Philadelphia County. 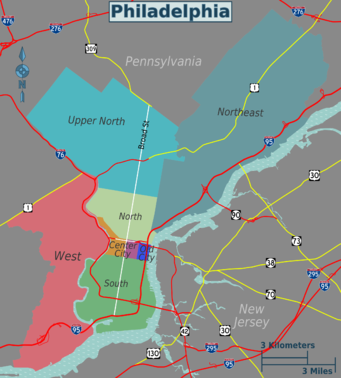 Philadelphia sits adjacent to the New Jersey and Delaware borders, and as such, its metropolitan area encompasses counties in Pennsylvania, New Jersey and Delaware. Philadelphia, once the capital of the United States, plays an exemplary role in the history and life of the nation. Its colonial legacy and architecture are almost unrivaled and its universities, museums, companies and laboratories are world class. The city has also become an increasingly important cultural and artistic center as well in the past few decades. As Philadelphia rebounds from its mid-20th century decline, the city is now seen as a model for sustainable urban growth and a surprisingly affordable haven for those seeking the best of urban American life without the expense or pretense of other neighboring East Coast cities. For most visitors, the landing point will be Center City, the "downtown" section of Philadelphia. It is bounded by Vine St. to the north, the Delaware River to the east, South St. to the south, and the Schuylkill River to the west. The 2010 Center City residential population of 57,000 makes it the third most populated central business district in America, behind New York City and Chicago. Other popular districts to visit are Old City, West Philly, and South Philly. Philadelphia's beautiful City Hall, the Convention Center, Chinatown, Washington Square West, the gay-friendly Gayborhood, and the Broad Street Arts Corridor. West of Broad Street and City Hall, includes the art museum district, Rittenhouse Square, shopping resembling an outdoor mall with dining on Chestnut and Walnut Streets, and a good portion of the central business district with Philadelphia's tallest skyscrapers. Philadelphia's oldest historic quarter, where the roots of the American Independence began. Located between 6th Street and the Delaware River, it features Independence Mall and historical landmarks like the Liberty Bell, Constitution Hall, and Independence Hall. Also of significance are the art, design and fashion businesses and galleries, making Old City a vibrant and culturally diverse neighborhood with an 'old world' European aesthetic. Evening hours bring added excitement with great restaurants, bars and clubs. South Street, the Italian Market, the Sports Complex, endless cheap dive bars, and Philly cheesesteaks. Working class neighborhoods, some of which are struggling with crime problems, but also the home of Temple University and Northern Liberties. 2nd street in Northern Liberties is lined with bars pubs and storefronts with a bohemian hipster feel. The Piazza at Schmidts located at 2nd & Germantown Ave is a mixed use development with a large European style plaza surrounded by an old brewery turned apartments with bars and shops at ground level. The stretch of Frankford Avenue running through the Fishtown neighborhood from Delaware Avenue to E. Norris Street is home to many galleries, renown restaurants, the Sugarhouse Casino and a plethora of nightlife options, including The Barbary, Barcade, Johnny Brendas and Frankford Hall. West of the Schuylkill River, includes University City comprising of University of Pennsylvania and Drexel University and its surrounding neighborhoods. The off-the-beaten-path northwestern reaches of the city, most notable for historic Germantown; the scene of a key Revolutionary War battle at Cliveden, and the home to historic colonial and victorian era homes such as Ebenezer Maxwell mansion as well as middle-to-upper class residential neighborhoods of Manayunk, Chestnut Hill, East Falls and Mt. Airy. The far northeastern part of town, mostly residential. Philadelphia, often called the "Birthplace of America" and referred to as the "new Athens" early in its existence, is the birthplace of America's modern republic. Founded by William Penn in the late 17th century, the city's name translates to "City of Brotherly Love" and has been a seat of freedom since its inception; originally founded by Quakers, the colony promoted religious freedom among its residents in stark contrast to the England of the time. Known for its role in the American Revolutionary War, Philadelphia saw the convening of the Continental Congress as well as the writing of the Declaration of Independence and the Constitution. Shortly after the nation's inception took place in Philadelphia, the city was named the nation's capital, a role it filled from 1790 until 1800, when Washington, D.C. took over. Benjamin Franklin, probably the city's most famous resident, was responsible for the city's alternative title, the "new Athens." While Franklin's most famous experiment dealt with the conducting of electricity, he was also responsible for the country's first insurance company, the city's first public library and the first fire department; Franklin also played a great role in establishing the city's postal system as well as inventing new conveniences such as bifocal lenses and the Franklin Stove. Philadelphia has seen its skyline and its name in lights throughout the years in such famous films as the "Rocky" series (the statue from "Rocky III" still stands prominently outside the Philadelphia Museum of Art), as well as films like namesake "Philadelphia" and many of Philadelphia native M. Night Shyamalan's thrillers. The Liberty Bell is right in the center of Philadelphia inside of a pavilion near Independence Hall. The Liberty Bell is a major piece in Philly's history. It was rung to announce the news of the passage of the Catholic Emancipation Act of 1829 in Great Britain. John Sartain in his book, Reminiscences of a Very Old Man, claims the bell was cracked during this announcement: "The final passage of the Emancipation Act by the British Parliament is linked to a bit of Philadelphia history. On receipt of the news in Philadelphia the Liberty Bell in the tower of the State House was rung, and cracked in the ringing. When I was up in the tower in 1830, two years after, viewing the cracked bell for the first time, Downing, who was then the custodian of Independence Hall, told me of it and remarked that the bell refused to ring for a British Act, even when the Act was a good one." The Philadelphia area's 6.2 million inhabitants comprise a diverse group of almost every nationality. Philadelphia's primary cultural influences can be seen in its plethora of Irish pubs, the city's Italian Market, the Chinatown District, and the Reading Terminal which plays host to a diverse crowd of merchants — from first-generation European and Asian immigrants to the area's local Amish and Mennonite farmers. Philadelphia's economy is as diverse as the population that inhabits the city. In Old City, the 'Third Street Corridor', from 3rd and Chestnut Streets to Vine Street, is home to many locally owned businesses contributing to art, design and fashion industries. The Philadelphia Stock Exchange, the oldest one in America, has been in operation since 1790. In addition, the city is host to several Fortune 500 companies, including Comcast (the nation's largest cable television provider), CIGNA insurance, Aramark, and Lincoln Financial Group. The University of Pennsylvania and Urban Outfitters are the largest employers. In the region there are approximately 50 higher educational institutions making Philadelphia a large 'college town'. Dating back to the city's roots as the nation's first capital, the federal's government presence is also strong in Philadelphia. A U.S. Mint is located near Philadelphia's historic district and the Philadelphia division of the Federal Reserve Bank is close to that. The city also plays host to a large number of prestigious law firms and is considered one of the nation's centers of law. The Pennsylvania Railroad, once the largest railroad company in the world, continues to influence Philadelphia's economy under the Amtrak name. Amtrak's second-busiest station, 30th Street Station, is on the west bank of the Schuylkill River and employs many Philadelphians in customer service, engineering, accounting, and IT jobs at the station. Finally, many medical schools, pharmaceutical companies, and medical technology firms make their homes in and around Philadelphia, arguably making it the nation's healthcare capital. Philadelphia has a humid subtropical climate with four distinct seasons. Winters, despite the name 'subtropical', are cold and often snowy, with temperatures usually hovering around 32°F (0°C) during the colder months. Average annual snowfall is 24 inches (59 cm) which is spread out mainly from December to March, but the area is sometimes hit by devastating blizzards that can dump up to half that total or even more on the city in one day, such as in 1996 when a single storm dumped 30.7 inches (78 cm) of snow on the city in just a couple of days. Spring and fall are rather pleasant, with temperatures in the 60s and 70s F (15°C-25°C). Summers are hot and humid, and conditions can get quite unpleasant when the air temperature is near 90°F (32°C) and humidity is high. Philadelphia International Airport (IATA: PHL, ICAO: KPHL) is the largest airport in the Delaware Valley, just minutes from the city and is served by taxis and the SEPTA R1 Regional Rail Line. Taxis offer a flat rate of $28.50 from the airport to Center City. The Septa airport railway line serves each terminal throughout the day until approximately midnight and takes about twenty minutes to travel between the airport and Center City Philadelphia, making stops at all major commuter tunnel stations: 30th Street Station (Amtrak), Suburban Station (Penn Center, City Hall) and Market East Station (East Market Street, The Gallery, Pennsylvania Convention Center, Reading Terminal). Tickets for the Airport train can be purchased on-board the train, cash-only, for $8. Tickets can also be purchased with a credit card on the Mozio iOS App for $6.75. Tickets purchased at ticket windows at stations in Center City cost $6.50. You can also buy a day pass for $11 valid on all regional rail trains after 9:30 a.m. (except into New Jersey) either on-board the train or at a ticket office. However, if you buy on-board the train be advised that to use your pass on SEPTA services other than Regional Rail, you will have to trade in your pass for an Independence Pass at a ticket office in the city center. A family pass is available for $25; the same restrictions apply. Alternately, the #37 SEPTA bus stops at all terminals (Directly outside baggage claim) and goes into South Philadelphia, terminating at the Broad Street Line subway station "Snyder." The trip costs $2.25 cash, payable to the driver. The predominant carrier at PHL is American Airlines, which offers flights to destinations throughout the U.S. and Europe, as well as a handful to Latin America. Southwest has become American's main domestic competitor at PHL, and the two airlines constantly attempt to outbid each others fares on many trunk routes. Air charter companies such as Monarch Air Group, Mercury Jets fly a variety of private charter aircraft and jets, from charter luxury Gulfstream's down to economical piston twins for small groups and individuals. Other nearby airports such as Trenton-Mercer Airport (IATA: TTN, ICAO: KTTN), Atlantic City International AirportIATA: ACY, ICAO: KACY), and Wilmington-Philadelphia Regional Airport (IATA: ILG, ICAO: KILG) have regularly scheduled service from low cost carriers such as Frontier and Sprit Airlines. Train-to-plane connections are available between Philadelphia's 30th Street Station (IATA: ZFV) and Newark International Airport (IATA: EWR, ICAO: KEWR) or Baltimore-Washington International Airport (IATA: BWI, ICAO: KBWI) (1 hr from EWR; 80 min from BWI). United Airlines sells tickets between 30th Street Station and Newark Airport as part of its partnership with Amtrak. Other New York and Washington-area airports are much less convenient. Philadelphia proper also has the Northeast Philadelphia Airport (IATA: PNE, ICAO: KPNE). PNE is Pennsylvania's 6th busiest airport. It opened in 1945, which was a great relief to the city, in which PHL (then called the Philadelphia Municipal Airport) was shut down. Currently, it operates as the city's general aviation airport and does not have scheduled commercial airline service. The city is a major hub along Amtrak's Northeast Corridor and Keystone lines, with frequent trains (at least once an hour during the day) from some of the nation's largest cities. Inbound trains from Washington and New York arrive at least once an hour during the day; 30th Street Station is also part of Amtrak's Acela High Speed Corridor which allows for faster travel times between the major Northeast Corridor cities. The Keystone and Pennsylvanian trains arrive in Philadelphia many times throughout the day, with Keystone service between Harrisburg and Philadelphia arriving between 10-14 times daily and Pennsylvanian service between Pittsburgh and Philadelphia arriving once each day. Additionally, Amtrak provides service to Vermont, Virginia, Charlotte, and overnight service to Florida and New Orleans. Passengers with Amtrak tickets may transfer to SEPTA's Regional Rail lines for free, provided they are traveling the same day to or from Suburban Station or Jefferson Station. This an easy way for Amtrak travelers to travel between 30th Street Station and Center City. It's also possible to get to Philadelphia from NYC via commuter rail. Using this method, one would take New Jersey Transit's Northeast Corridor line from Penn Station to Trenton and then transfer to SEPTA's Trenton Regional Rail Line. While this is about a third the price of Amtrak service from NYC, it is more than an hour slower. All SEPTA Regional Rail commuter lines stop at the SEPTA Platform at 30th Street Station. Commuter rail is an efficient way to see the scenic Philadelphia suburbs and enjoy the shopping that the city's 'burbs have to offer. New Jersey transit to and from Atlantic City makes stops around the clock at the station. SEPTA's Market-Frankford Line stops just one block outside the station at a newly-renovated station and is efficient for travel between 30th Street, Center City, Kensington/Northern Liberties, Old City, and West Philadelphia. As a last resort, and most costly depending on destination, 30th Street Station has a taxi platform just outside the main entrance that is served by all major Philadelphia taxi companies, Uber and Lyft. Several rental car agencies have cars at 30th St Station. Philadelphia is located at the crossroads of many of the region's and the nation's most vital Interstates. Interstate 95 runs along the Eastern edge of Philadelphia as it traverses the East coast from Maine to Miami (However, there is a gap on the New Jersey stretch between Philly and New York City). In addition, Philadelphia is linked to the Pennsylvania Turnpike which traverses the state from east to west. The Northeast Extension of the Turnpike connects Philadelphia to the Poconos and Wilkes-Barre-Scranton. It is also served by I-76 and I-676, which connect directly to the New Jersey Turnpike and Atlantic City Expressway, and indirectly to the Garden State Parkway. Within the city, Route 1 (also called the Roosevelt Expressway) as well as Roosevelt Boulevard serves as a connector for Northeast Philadelphia and Center City. There are also bridges across the Delaware River that link Philadelphia to New Jersey. Of these bridges are Tacony Palmyra Bridge (Route 73), Betsy Ross Bridge (Route 90), Benjamin Franklin Bridge (US 30) and Walt Whitman Bridge (I-76). Parking — It is important to consider that Philadelphia is a city of 1.4 million and the center of a metro area of 6 million, and as such, the roads are congested round-the-clock and the parking is very expensive in the downtown area. An option is to park at the end of the subway lines for very little. You can park and ride for $1.00 at AT&T station Orange line Mon-Fri until 7:00pm but you must get there before 12:00pm. Should you choose to bring a car, check with your hotel about parking in the city. Legal street parking is available but is very difficult to find close to Center City attractions or hotels. Secured parking garages can cost $10-35 per day or higher in some cases. In the historic district, there were several parking options under $20. Visitors should also be aware that the Philadelphia Parking Authority is renowned (even notorious) for its efficiency and PPA parking enforcement personnel are as quick to write tickets as they are unlikely to yield to a violator's plea for leniency. Tickets that are not paid promptly quickly accumulate additional penalty fees. It is also worth mentioning that the only coins that the meters accept are dollar coins and quarters. Putting other coins in the meter will not give you extra time. Fortunately, depending on where you are in the city, a quarter can give you up to a half hour of parking. However, in busy places such as Chinatown and Center City, a quarter can get you just eight minutes of parking. Recently, a new parking method has been brought about in the city. Although there are still parking meters throughout the city, many streets in Center City and University City have a kiosk in which patrons can use bills (not just quarters!) to print a ticket which they leave on the dashboard. Credit and debit cards can also be used for payment at these kiosks. Traffic — In terms of congestion Center City Philadelphia compares favorably to most large U.S. cities (the traffic is worse than Dallas). Gridlock does occur, however, particularly during rush hour. Traffic generally moves at the slowest pace in the Chinatown neighborhood, on the numbered streets west of Broad and in the South St. and Old City areas on weekend evenings. Broad St. is "nicely" congested. The most heavily-traveled roads in the area are I-95, I-676/I-76 (The Schuylkill Expressway aka "The Surekill"), which connects Center City to the various suburbs west of the city, and I-476, the "Blue Route," which curves from the south to the west of Philadelphia, connecting I-95 with I-76 and, beyond that, the PA Turnpike. Rush-hour delays are common on all these roadways: During the morning rush-hour I-95 south-bound typically backs up between the Bridge St. and Girard Ave. exits and eastbound Rt. 76 (The Schuylkill Expressway)typically jams from Gladwynne to 30th St. During the evening rush-hour, I-95 usually slows from the Bridge Street to Academy Road exits. On I-676 and the west-bound Schuylkill traffic can be stop-and-go from roughly Broad St. potentially all the way to the so-called "Conshohocken Curve," just east of the town of the same name, effectively doubling the time it normally takes to drive from Center City to the PA Turnpike entrance at King of Prussia. Anyone planning to drive through Philadelphia during either rush hours would do well to anticipate traffic conditions and plan accordingly. In 2009, there has been roadwork in the late evening/early morning hours on I-76 and I-95, thus intensifying the traffic on those main routes. Philadelphia is served by the Greyhound, Trailways, Bieber, and Peter Pan bus routes to cities across the U.S. The city is also served by a Chinatown Bus service, which began as a way to shuttle Chinese immigrant workers between various Chinatowns, but are now low-cost bus options for anyone looking to get in to Philadelphia from New York City or Washington, D.C. Although the buses are a bargain compared to corporate competitors like Greyhound, they are far from luxurious; they also use small terminals in both Chinatown districts, and have a poor reputation for safety, which can be daunting for less adventurous visitors. To compete against the Chinatown buses in the low-cost, low-frills bus market, corporate bus companies have started Megabus and BoltBus services. In Philadelphia, these buses will arrive near 30th Street Station. Metropolitan Shuttle Metropolitan Shuttle. 11141 Georgia Ave., Ste. 218, Wheaton, MD 20902, +1 866 556 3545. Metropolitanshuttle offer charter buses and rental bus services. If you buy tickets online, be sure to get on the right bus. Some companies trick you into taking the wrong bus and then charge you again. The Greyhound Bus Terminal near Market East Station is notoriously chaotic during peak hours. Buses departing from this terminal on high-demand routes (e.g. to New York) are regularly overbooked and leave when they are full. So having a ticket in this situation does not guarantee you a spot on the respective coach. Should you need to catch a specific coach when travelling with these operators, it is advisable to purchase an "express" ticket that guarantees you a seat (slightly more expensive though). Alternatively, use companies that guarantee you a seat (e.g. MegaBus, BoltBus). The RiverLink and Freedom Ferry services provide travel from Philadelphia to neighboring Camden, NJ between April and September. The service provides direct service to Camden's Susquehanna Bank Center on the Waterfront, a popular concert venue for the Philadelphia area. Access to the other waterfront attractions, including an aquarium, is also provided by the ferry service. There are plenty of public transportation options to get around the downtown core of Philadelphia. Busses, trains, and trolleys gather at 30th St. Station and the 69th St. Transportation Centre. Philadelphia is one of America's most walkable cities. This has been taken advantage of and the city is marked extremely well by "Walk! Philadelphia" signs that are placed on each block, sometimes only several feet apart, that guide visitors toward shopping, dining, gallery perusing, cultural enjoyment, local must-sees and public transportation should it need to be taken. The city has two very walkable shopping districts as well as the walkable Benjamin Franklin Parkway, which is home to many museums, including the Franklin Institute and the Museum of Art that was made famous in the "Rocky" movies. Philadelphia has a growing bicycle-friendly culture that includes a network of bike lanes and a new citywide bike share service called Indego. Indego has over 600 recognizable blue bikes and 60 stations throughout Center City and the surrounding areas, and offers multiple payment options: 1. With a $15, 30-day membership, riders get unlimited free rides of up to one hour, with additional hours costing $4; 2. With a $10 year long membership, rides are $4 per trip, with hours past the first hour costing $4; and 3. Without a membership, rides are $4 per half hour. As of 2018, protection for cyclists is a hot topic in the city, after the death of local activist Pablo Avendano was caused by an SUV's negligence on Spring Garden St. As such, tensions are high between motorists and cyclists in many parts of the city. Please ride with care. SEPTA BUS runs an extensive bus network in Philadelphia. Buses are a convenient (if slow) method of getting almost anywhere within the city. On-time performance is relatively lacking especially in the suburbs, and it's bound to happen to you at least once in a weekend if you take the bus heavily. Frequencies are spotty in the outer suburbs so plan ahead. Cash fare $2.50, exact change only. In Center City, bus routes will be fairly well documented on bus shelters, but in all other locations around Philadelphia, route maps and schedules will generally not be posted; in fact the stops or route markers may only be posted on a tree branch, so do your bus route research early. Phlash Bus. Philadelphia has a seasonal (May-October) trolley bus for tourists called the Phlash. It runs in a 20-stop East-West circuit of major tourist locations, from the Museum of Art in the West to Penn's Landing in the East. Free for kids under 5 and for senior citizens (aged 65 or more). It is $2 per ride or $5 for a one day pass. Look for the purple trolley bus or the winged purple & blue logo. The hubs for regional rail (commuter) are Suburban and Jefferson (formerly Market East) Stations in Center City and 30th Street Station (just outside Center City with connections to Amtrak). Major subway/elevated/trolley transfer stations are located at City Hall/15th Steet (adjacent to Suburban Station), 8th Street (connecting several SEPTA lines and PATCO), and 69th Street Terminal in Upper Darby. SEPTA Regional Rail regional commuter rail trains stop in Center City at underground commuter rail tunnels. The three major center city stops, 30th Street Station, Suburban Station and Market East Station, will drop you off right in the center of it all. Suburban Station is near City Hall, the shopping district, the financial district, and many cultural attractions; Market East Station connects to the Pennsylvania Convention Center, shopping at The Gallery ("Four blocks long, four stories high!") and the Reading Terminal Market, a famous local marketplace. Traveling within Center City is considered a "Zone 1" fare and will cost $3. Seniors ride for $1. Fares to other destinations are up to $8. Between Temple University, the city center stations and University City, service is generally frequent enough that you won't need a schedule. Service in other areas tends to be about every hour, with more frequent service during peak hours. The R1 Airport comes every 30 minutes from about 4:30 AM to midnight 7 days a week, and R5 Paoli/Thorndale and R5 Lansdale/Doylestown also have half-hourly service during the day on weekdays. The lightly-used R6 Cynwyd only comes Monday through Friday on an erratic, rush hour centered schedule. Regional Rail lines were numbered R1 through R8 - there are actually 13 lines so some numbers belonged to more than one line. For example, the R3 West Trenton would take you to suburbs northeast of the city while the R3 Elwyn would take you southwest. As part of a customer service initiative, in 2010 SEPTA dropped the R-number naming system and renamed the lines according to their termini. This was done to ease confusion among visitors and infrequent riders. New Jersey Transit RiverLINE is a lightrail line serving 20 stations between Trenton and Camden, NJ. The line connects with DRPA's PATCO Hi-Speed Line at Camden's Walter Rand Transportation Center. RiverLINE travels North-South along the Delaware River entirely in New Jersey. One-way fare between Trenton and Camden, NJ is $1.50. There are reduced fare options for senior citizens, children and families. Monthly passes are available. Trains come every 15 minutes during rush hours but only every 30 minutes at other times. There is no late evening service except on Saturday nights. New Jersey Transit Atlantic City Line provides service to suburbs in New Jersey and to Atlantic City. Service patterns are somewhat uneven; be sure to check the schedule online in advance. These trains pick up passengers from the Amtrak concourse at 30th Street station. SEPTA operates two elevated/subway lines, and a Subway-Surface line that serve Center City Philadelphia as well as the smaller neighborhoods on the city's fringe. Cash fares are $2.50 per trip. A day pass good for 8 trips can be purchased from any SEPTA Vending machine for $9. Seniors ride free with ID. Broad Street (Orange) Line — referred to as the "subway" by locals — runs North-South underneath Broad St., one of Philadelphia's two major streets. It serves Temple University, City Hall, the Sports Stadium Complex and everywhere in between. The BSL also has a "spur" called the Broad-Ridge Spur that serves Chinatown and 8th & Market Sts. in Center City. Free transfers from the Broad St. Line to the Market-Frankford Line can be made at City Hall Station (BSS) to 15 St. (MFL); a free interchange with Subway-Surface Lines can be made at the City Hall station. Transfers from a subway to a bus or from a bus to a subway cost $1.00 and must be purchased before the bus or train leaves the station. This transfer is also required from the 8th St. Ridge Avenue spur to the 8th MFL station. Market-Frankford (Blue) Line — referred to as the "el" by locals — runs North-South from the Frankford Transportation Center in Northeast Philadelphia to 2nd and Markets St., then East-West between 2nd and Markets St. and the 69th St. Terminal in Upper Darby. The line runs underground beneath Market Street from 2nd to 45th Streets within Center City, Old City, and University City, and is elevated elsewhere. An interchange with the Broad-Ridge Spur is available at 8th St. Station; an interchange with SEPTA's Regional Rail is available at 11th St. to Market East Station, 15 St. to Suburban Station, and at 30 St. to the 30th St. Amtrak Station; a free interchange with the Broad St. Line is available at 15th St. Station. Free interchanges with the Subway-Surface Lines are at 13th St., 15th St., and 30th St. Stations. Subway-Surface Lines — referred to as the "trolley" by locals — is actually a set of five streetcar lines: 10 (Lancaster), 11 (Woodland), 13 (Chester), 34 (Baltimore), and 36 (Elmwood). Each runs along a different avenue in West Philadelphia, but all meet at a subway portal at 40th St. and Woodland Ave. (except the #10, which joins the subway at a portal at 36th St.) to run in a streetcar subway under the University of Pennsylvania and Drexel University to 30th St., then under Market St. from 30 to Juniper St, near 13 St. It shares 30th, 15th, and Juniper/13th St. stations with the MFL, but is the only subway stopping at 19th and 22nd Sts. along Market St. There is a free interchange between the lines at all three shared stations. There is no cross platform interchange because the MFL has high platforms, and the Subway-Surface has low platforms, and these have to be on the right side of the streetcar. Passengers who wish to use a combination of SEPTA trolley, bus and subway around downtown Philadelphia may purchase a one-day convenience pass. It costs $8 and may be purchased from the ticket booth at a SEPTA subway station. Unlike other metropolitan transit systems, the one-day pass does not entitle the passenger to unlimited rides on the entire system and limits it to 8 rides on the day it was purchased. That said, it effectively brings down the cost of each ride to $1 (compared to the standard fares of $1.80 to $2.25). To use the pass, present it to the driver or station attendant at the fare gate who will punch the ride number (from 1 to 8) you have taken to indicate how many rides were used. Transfers that require you to exit the station fare gates will be counted against the number of rides allowed by your pass. Transfers to a bus will also be counted against your ride allowance. The pass is not valid on regional/commuter rail lines. However, SEPTA offers the Independence Pass, which is a one day pass that is valid on all modes of transit, including the regional rail lines. The Independence Pass costs $12 for an individual and $29 for a family. Taxis are regulated by the Philadelphia Parking Authority and display a medallion license on their hood. All taxis are metered. Rates are $2.70 at flagfall, $2.30 per mile (1.6 km), and $.23 every 38 seconds the taxi is stopped. There is also a variable gas surcharge. In July 2012 it was $1.15. For trips from the airport, a flat rate, including fuel surcharge, of $28.50 applies. An additional $1 per passenger ($3 maximum) after the first passenger will be charged on flat rate trips between the airport and Center City for those passengers over the age of 12. Tipping for good service is common. Philadelphia is also home to PhillyCarShare and Zipcar, where, after registering, you can book vehicles by the hour or day for significantly less than a rental car. PhillyCarShare has vehicles including Toyota Priuses, Volkswagen Beetles and Mini Coopers stationed at various locations called 'pods' around Philadelphia. You first book online, and then use your personal key to unlock the vehicle and away you go. Rental is $5.90-7.90 per hour, or approximately $50 for a full day, plus a few dollars booking fee and $0.09 per mile (1.6 km) traveled. SEPTA operates 8 trolleys lines, including the 5 aforementioned subway-surface branch lines, as well as two suburban trolley lines that travel from the 69th St Terminal in Upper Darby. The 101 line travels to Media, while the 102 line travels to Sharon Hill, both in Delaware County. In addition, the 15 line (running along Girard Ave.) has recently been renovated and vintage trolley cars are now in use on this route. Connections to this line can be made at either the Broad Street Line or Market-Frankfort Line Girard Stations; a transfer should be purchased upon boarding the trolley or entering your origin subway station for 75 cents to avoid paying an additional fare when making the connection. Among its other uses, the 15 line provides the only rail link to the Philadelphia Zoo. SEPTA has also been studying whether to restore trolley service on former lines, as many miles of rail are still in place. Philadelphia is a huge city, so all individual listings should be moved to the appropriate district articles, and this section should contain a brief overview. Please help to move listings if you are familiar with this city. Travelers planning to visit multiple attractions may benefit from Philadelphia CityPASS, which grants admission to 6 Philadelphia attractions within 9 days of first use for a much reduced rate and includes expedited entry in some cases. The included attractions are: The Franklin Institute; Adventure Aquarium; Phila Trolley & The Big Bus Company, 24 hours of on-off privileges; Philadelphia Zoo; Option Ticket One with choice of either The Academy of Natural Sciences or the National Constitution Center and Option Ticket Two with choice of Please Touch Museum or Eastern State Penitentiary. A Weekend in Philly offers a detailed itinerary that includes several of these attractions. Much of Philadelphia's art requires not a dollar to see and not a building to enter. Philadelphia has the largest collection of public art in the nation, courtesy of the city's innovative Mural Arts Program, designed to stop graffiti and enliven the city's buildings. They even provide a free tour. Other public art of note includes the many glass mosaics found throughout the city; a sampling of this great public art can be seen on South St. east of Broad. Center city Philadelphia offers many public statue displays. "The Clothespin" is a sculpture by Claes Oldenburg that resembles a clothespin located just across from City Hall on West Market St. LOVE Park, serving as a terminus between City Hall and the museum-laden Benjamin Franklin Pkwy., features a famous LOVE statue that has come to represent the brotherly love that Philadelphia was founded on. The site once was the city's (and perhaps the nation's) most popular skating attraction until new legislation and remodeling efforts outlawed skating in the park. Just across the JFK Blvd. from City Hall at the Municipal Services Building, visitors can find many larger than life game pieces from popular board games as well as a statue of former mayor Frank Rizzo. More statues can be found throughout Fairmount Park along Kelly Dr. on east side of the Schuykill River. Sculptures by Remmington can be found on the path, while several sculptures by Alexander Milne Calder can be found in Laurel Hill Cemetery, which is located just off the paved walking path. is a folk art environment, gallery space, and nonprofit organization that showcases the work of mosaicist Isaiah Zagar. 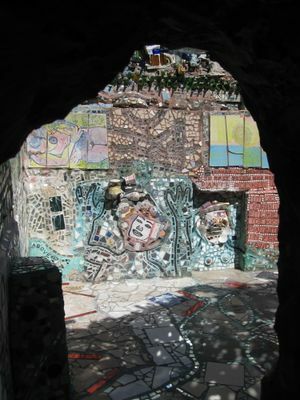 Located at the site of Zagar's largest public mosaic installation, the Magic Gardens includes a fully mosaiced indoor gallery and a massive outdoor labyrinthine mosaic sculpture. The installation, primarily consisting of found objects and contributions from the community, covers half a city block with myriads of tile, texture, and color. A walk through the labyrinth will reveal sculptures from Latin America and Asia, bicycle wheels from local South Street shop Via Bicycles, Zagar's hand-made tiles, and mirrors of every shape and size. There is a fee to visit the Magic Gardens (Adults $5; Youth 6-12 years $2; Kids 5 and under free), but much of Zagar's work can be seen around the city for free. Center City West is home to the Philadelphia Museum of Art, Barnes Foundation, Academy of Natural Sciences, Franklin Institute Science Museum, Mutter Museum, Rosenbach Museum & Library and Rodin Museum. Center City East is home to the African American Museum, and Atwater Kent Museum of Philadelphia History. Old City is home to the National Museum of American Jewish History and Independence Seaport Museum. West Philly is home to the Please Touch Museum North Philly is home to the Wagner Free Institute of Science. Washington Square (southeast), Franklin Square (northeast), Logan Square (northwest), and City Hall (center) make up the other four original "squares" created by William Penn. Four of the five squares (Logan Square is better known as Logan Circle) are somewhat symmetrically located at the four corners of an imaginary square surrounding the very center of Center City, now occupied by City Hall. The center of City Hall's Square is a large compass in the ground. There are four archways leading into it. Logan Circle, named after William Penn's secretary James Logan, is considered the gateway to Fairmount Park and the Art Museum area. Up until 1823, Logan Circle was an execution site as well as burial ground. Located in Logan Circle is the Swann Memorial Fountain. Washington Square is near Independence Hall. It was also used as a burial ground and in addition, as a potter's field. Franklin Square is located on the outskirts of Chinatown at 6th and Race Streets. It is home to the Philadelphia Park Liberty Carousel, has a Philadelphia-themed miniature golf course, two playgrounds, and a gift shop. Like Logan Circle, Franklin Square also has a fountain. New technology causes the water to shoot lower on rainy or windy days so by standers do not become wet. Spruce Street Harbor Park, a fantastic pop-up park in the spring and summer on the Delaware river waterfront. It features a hammock garden with colorful LED lighting strung from trees, lawn games, three floating barges on the water with a bar serving local beer, and a row of street food vendors from popular local restaurants including Federal Donuts and Franklin Fountain ice cream. FDR Park, known as "The Lakes" to the locals, is in South Philadelphia near the stadium district. It offers many activities such as fishing, bird watching, tennis, baseball and rugby. There is also a skate park underneath the bridge that runs throughout the park. Located within FDR is Bellaire Manor. Pennypack Park Large city park ranging throughout Northeast Philadelphia. This park includes creeks, waterfalls, biking trails, dog walking trails, and home to the Pennypack Park Music Festival. The music festival originally began in the 1970's, but ceased to exist in the 90s, due to insufficient funds. The music festival came back to life in 2000 with funding from local organizations. Pennypack is a thriving park that is utilized by the Northeast residents daily. Penn Treaty Park, located at Delaware and Columbia Aves. in a neighborhood known as Fishtown. Legend has it that it was here in 1682 William Penn and Lenape Indians made a treaty known as Penn's Treaty. Just North of Center City along the edge of the Delaware River Penn Treaty Park is a community pride with many events throughout the year, as well as attracting many visitors for its wonderful view of the river. Park has walking paths, picnic tables, benches, a playground for children as well as open field for other activities. In May, 2012 the Park has been recognized by Philadelphia Historical Commission and placed on the Registrar of Philadelphia Historic Places. Penn Treaty Park is a home to: an Obelisk of the Treaty Ground erected in 1827; William Penn Statue unveiled 1982; Bob Haozous Penn Treaty sculpture placed in 1991. Every year, Philadelphia is host to the Philadelphia International Championship, which is a 144-mi (232 km) bike race from Benjamin Franklin Parkway to the hillside community of Manayunk, which is the site of the Manayunk Wall. 2010 marks its 26th year running. The event usually takes place in early June. The Philadelphia Marathon is also another annual event. This marathon race is held every 3rd Sunday in November. There are three races: the full marathon, half marathon and the "Rothman Institute 8k". Every year in the beginning of July, an All-You-Can-Eat Ice Cream Festival is held down Penns Landing. $5, children under 2 free. AIDS Walk Philly occurs every October. It is an 8.2-mi (13 km) walk that begins and ends at Eakins Oval (in front of the stairs of the Philadelphia Art Museum). The first walk started in 1987 and raised $33,000 that year. Since then, the event became annual. The Mummers Parade is held each New Years Day. The first official parade took place on January 1, 1901. Local clubs (usually called New Years Associations) compete in one of four categories (Comics, Fancies, String Bands, and Fancy Brigades). They prepare elaborate costumes and moveable scenery, which take months to complete. The parade of over 10,000 marchers travels approximately 3 miles northward on Broad Street, beginning in South Philadelphia and concluding near City Hall in Center City. Philadelphia prides itself on its wide variety of live performances, particularly for music. Venues can be found throughout Center City East and West, Old City, South Philly and the Northern Liberties/Fishtown districts of North Philly. R5 Productions  promotes smaller bands and affordable shows at several local venues. Walnut Street Theater Walnut Street theater puts on many productions including Music Man and Love Story amongst many more. Address: 825 Walnut Street, Philadelphia, PA 1910. College sports – The Philadelphia area is also a mecca for college sports, especially men's basketball. One term you will often see in the sports pages, talk shows, and general sports conversation is "Big 5". This refers to the heated men's basketball rivalry between five of the major universities in the area—Temple, Villanova, Saint Joseph's, Penn, and La Salle. Full of of historical landmarks, Philadelphia is home to numerous tours. Philadelphia Segway Tours by Wheel Fun Rentals . 215-523-5827. Located at the Independence Visitors Center . Philadelphia is rich with educational opportunities. Universities include Temple University, Philadelphia University , Drexel University  with the only co-op program in the area, the Ivy League University of Pennsylvania , La Salle University  a major Catholic university, Saint Joseph's University  a Jesuit university, and The Lutheran Theological Seminary at Philadelphia  a divinity school; as well as "Westminster Theological Seminary"  in Glenside. The Community College of Philadelphia  is Philadelphia's premier community college. Art schools include the University of the Arts , one of the most prestigious art schools in America, Pennsylvania Academy of Fine Arts , Moore College of Art and Design  an all women college, Hussian School of Art , and the Art Institute Philadelphia . Trade schools include The Wine School of Philadelphia  which offers professional sommelier & winemaking diplomas, along with wine tasting classes . Philadelphia's job market is ever-expanding both in the city and in its suburbs. The 975' Comcast Center is a constant reminder of the economic revitalization of Philadelphia and of Comcast's presence in the city. Additionally, a Keystone Opportunity Zone over the Powelton Rail Yards adjacent to 30th St. Station promises a bright future for jobs and new office buildings in the city. For unique shopping, there are distinct districts. 3rd Street Corridor in Old City continues steadfast with Philadelphia's founding entrepreneurial spirit of independence. This 'Old World' section has the city's acclaimed independent retailers for fashion, art and design. Landmark Sugarcube®  should not be missed for the fashion savvy. Salon-goers will enjoy Moko, an organic beauty studio along the corridor. Going southwest from Old City is Antique Row, on Pine Street between 9th and 13th (Center City), is home to a mix of antique stores and local gift and craft boutiques. Further south is The Italian Market in South Philly an open-air street market with fresh produce and food; although it was historically an Italian district, there is now an infusion of Mexican culture. Another distinct area is Chinatown (Center City), an ethnic enclave of Asian Americans residents and business owners. West of Broad Street in Center City just south of City Hall is home to national brand based retail. Philadelphia's Old City district has always been a center of commerce and culture. As Philadelphia grew to be a larger city many shops and department stores were established on Market Street between Old City and City Hall. Two such landmark department stores on Market Street were Gimbels and Strawbridge & Clothiers. As growth of the city and region at-large continued during the 20th century, those same department stores found it increasing difficult to competing against suburban department chains. In the 1970s, the Gallery at Market East, an urban mall utilizing Gimbels and Strawbridge & Clothiers as major anchors, opened to stem the tide of retailers fleeing the urban core to the regional shopping malls. Despite initial success in the first decade or so of operation, the Gallery remained unable to compete; Gimbels closed in 1986, Strawbridge's closed in 2006 and now stands vacant. Currently in 2015 the mall is closed for renovation in a renewed effort to uplift Philadelphia's retail industry and increase property values. Before closing, the mall offered mid-range stores catering to the city's working class population, and had a busy food court on the basement level, convenient for the 12,000 or so daily commuters who took the regional rail into the city. Just northwest of the Gallery is the Reading Terminal Market, a very successful indoor public market that opened in 1893 at the site of the Reading Railroad's headhouse terminal, now part of the Philadelphia Convention Center, after open-air sidewalk markets were closed down in the 1850's due to health and safety concerns. Today some of the current vendors have been in business for over a century, and sell produce, meats, chocolates, and a variety of other usually handmade foodstuffs and items. There are small restaurants as well as a section for Pennsylvania Dutch (or Amish) vendors in this tightly packed historic market. West of Broad Street the adjacent shopping district of Center City eventually regained its footing as downtown Philadelphia revitalized. Starting in the 1980s and 1990s along Chestnut Streets and Walnut Streets west of Broad Street to Rittenhouse Square, features national brands, chain stores and a few boutiques, from the high-end Burberry, Tiffany and Diesel to lower scale with locally-managed corporate Anthropologie and Urban Outfitters. Chestnut Street also has a range of mid-range shops, a few independently owned boutiques as well as bargain big-leaguers like H&M. The Shoppes at Liberty Place is located Philadelphia's second-tallest building, and The Shops at the Bellevue is located in a historic building on Broad Street, both house retail chains and food courts in a 'mall like' environment. See the Districts articles for specific listings. No trip to Philadelphia is complete without trying the cheesesteak, Philly's most famous homegrown food, a sandwich made of a fresh roll filled with grilled shaved beef and cheese (as well as onions, mushrooms, and other optional sides). The spiritual homes of the cheesesteak are Pat's King of Steaks , where the cheesesteak was invented, and Geno's Steaks, where they claim to have improved on Pat's version. They are located next to each other in South Philly. Although Pat's and Geno's are the most famous cheesesteak joints, there are many others to choose from, particularly in South Philadelphia—John's Roast Pork at Snyder and alley-street Weccacoe is considered by many locals to offer a standout, and many prefer Jim's Steaks  or Tony Luke's . Though South Philadelphia is the undisputed home of this sandwich, Steve's Prince of Steaks in Northeast Philadelphia off Cottman Ave. is outstanding (new location in Center City at 16th and Chestnut as well). Campo's at 2nd and Market (Historic District) has been making cheesesteaks since 1947. Campo's  'The Great Northeast' is also home to Chink's Steaks, a delightful drug-store throwback on Torresdale Avenue near the Delaware River. No cheesesteak aficionado can call himself such without a visit to Dalessandro's Steaks or Chubby's on Henry Avenue in the Roxborough section of Northwest Philadelphia (north of Manayunk and East Falls). This regions best steak, though, is found at takeout only Sorrentino's on cresson in Manayunk. Sonny's in Old City, on Market St between 3rd and 4th, also serves an excellent cheesesteak in a location convenient to Independence Hall. Philadelphia's other notable sandwich is roast pork which can be found at Dinic's in the Reading Terminal Market, Tony Luke's, John's, or a latin version at Porky's Point. There's also a cheesesteak food cart on UPenn campus (33rd St) that serves a pretty decent version at lunch time for half the price of Pat's or Geno's. Lastly, the city's best Roast Beef sandwich served on a locally baked sarcone's roll is at caffe chicco. A caveat before ordering a cheesesteak, particularly at the often crowded Pat's and Geno's—know how to order. There is somewhat of a 'no soup for you' attitude at these busy and fast-service oriented establishments which can really make a tourist stand out. The way to order is as follows: It is assumed that you are going to order a cheesesteak, so unless you are not, don't specify this. First, say the type of cheese—only american, provolone, and whiz are generally available. Ask for swiss at your own risk. The only condiment that is not available in a jar outside the stand will be fried onions; with (or "wit" in Philly parlance) or without ("witout") will specify your preference on the matter. So 'Whiz "Wit", Provolone "Witout",' etc. Not too complicated, and a straightforward way to have a nice local moment on your travels. The cheesesteak may be the most well-known Philadelphia sandwich, but it was the hoagie that was named the "Official Sandwich of Philadelphia" by former mayor Ed Rendell. While the origin of the hoagie is disputed, with even nearby Chester city claiming to have invented it, what is not in question is the fact that hoagies are delicious. Consisting of cold cuts, lettuce, and other toppings on a hoagie roll, the hoagie is one of Philadelphia's oldest, most popular sandwiches. There are various types of hoagies, from Turkey hoagies to Italian hoagies and more, and locals often eat their hoagies with mayonnaise and "oil". Invented in nearby Tinicum, in Delaware County, the stromboli is another local food staple. Similar to a calzone, a stromboli is a turnover that is made from either Italian bread dough or pizza dough, and can be filled with a variety of ingredients. The most common types of stromboli are pepperoni, vegetable, meatball, pizza, and cheesesteak, though strombolis can be filled with virtually anything. Another less well-known local food is the tomato pie, a type of pizza in which the sauce is put on after everything else, as opposed to before the cheese and other toppings. Derived from Sicily, the tomato pie was invented in the general Philadelphia area in the 1910s. Depending on the place, a tomato pie can either be thin crust or thick crust. You can also find cheesesteaks at Reading Terminal Market, located at 12th and Arch Sts. Here visitors will find many stands selling produce, meats, flowers, and baked goods. Reading Terminal Market is a good place to get lunch if you are in the area. The multitude of vendors and low prices provide plenty of options for a quick meal. It's also home to one of the city's best pretzels (Miller's). Families from the Pennsylvania Dutch (Amish) community of Lancaster County operate a number of the businesses in the market, but only on Tuesday-Saturday. One of the most famous Pennsylvania Dutch businesses at Reading Terminal Market is Beiler's Bakery. The line for fresh donuts from Beiler's is often long, but it moves quickly, and the donuts and apple fritters are worth it. Philadelphia's most famous snack is the salted soft pretzel, and Pennsylvania is the birthplace of the pretzel in the United States. Philly soft pretzels are distinctive in that they are flattened into a wide rectangle and are made in long chains in which the wide sides of the pretzels are attached. A person may typically buy two, three, or more attached pretzels at a convenience store or from a street vendor. The price is low, especially compared to national vendor brands sold in other cities and in malls. Unlike pretzels served in many other cities, Philly pretzels are not served hot, but at room temperature and often eaten with mustard. The most famous sweet snack is from the Tastykake brand. Their main factory is in the Navy Yard in far south Philly, so every flavor and type of TastyKake is sold in Philadelphia, and they are usually extra fresh, since they do not have to travel far to the retail outlet. Also unique to the area are Goldenberg's Peanut Chews , a bit-sized chocolate bar with a chewy peanut center. Originally developed as a high-energy ration bar during WWI, but still popular today! While not necessarily considered food, Philadelphia's own DubbleBubble is considered the first commercially successful bubble gum, and its parent company, Fleer pioneered the packaging of baseball cards with bubble gum. Scrapple is a favorite comfort food of native Philadelphians. Best described as a spicy breakfast pork product, scrapple is of Pennsylvania Dutch origin and is made from pork by-products (you're better off not knowing exactly what's in it) and cornmeal, cooked into a thick pudding, formed into a loaf, sliced, and fried. You'll find it on the breakfast menu of many neighborhood diners in Philly. Ask for it very crispy. Probably the most well-known local dessert is Italian style water-ice. Found all over the city and metro, some of the more well-known local standouts are John's in South Philly, Rosati's in Clifton Heights, Delaware County, and of course the locally-based chain Rita's. While both Rita's and Rosati's are available all over the country and even Internationally to an extent, only Rita's has multiple storefronts. Rosati's is available in businesses around the country and even Internationally but only has a single storefront, at its factory in Clifton Heights. Wawa (The name is derived from the Ojibwe word for the Canada goose) is a chain of local convenience stores similar to, but better than, 7-Eleven. They are most famous for their deli ordering terminals, which allow you to specify via a touch-screen monitor exactly what you want on a sandwich. Although locals refuse to consider Wawa's cheesesteaks as authentic, due to its use of ground beef rather than sliced or diced beef, the Wawa option is still delicious and you get to customize it with a wide range of options. Chickie's and Pete's Crab House and Sports Bar: This restaurant is known for its famous crab fries. They are dipped in melted American cheese and are a crowd favorite. Their menu also includes crabs, steak sandwiches, pork sandwiches and more. This restaurant also caters and does parties. You can find many Philadelphia sports fans here on a game day. Whether it is for drinking or eating out as a family this restaurant hits the spot. The original location is on Robbins Ave, but other locations include Bordentown, South Philadelphia, Philadelphia International airport, Drexel Hill and more. Philadelphia has an extremely vibrant culinary scene, with many young and enterprising new chefs coming to the City of Brotherly Love for its food-obsessed culture. Local restauranteurs such as Stephen Starr , Marc Vetri , Iron Chefs Masaharu Morimoto  and Jose Garces , and others have become household names and food celebrities in their own right, transforming Philadelphia's food scene and exporting its concepts to other parts of the country. In part, the scene is bolstered by a culture of organic and sustainable foodstuffs coming from local farmers. Pennsylvania's draconian liquor laws make it very expensive and inconvenient for restaurants to obtain liquor licenses. As a result, many restaurants—including some of the best—are BYOB, that is, Bring Your Own Bottle. These restaurants will advertise their BYOB-status, and will usually help you out by supplying corkscrews, glasses, or club soda, so long as you supply the beer, wine, or spirits. You'll have to pick wine or spirits up at a state-sponsored liquor store, or six-packs of beer from a neighborhood bar. Convenience stores usually do not sell alcoholic beverages, some local stores may sell beer. Even if you don't drink, or don't want a drink, dining at a BYOB can pay off as the restaurant doesn't need to pay off a license and can charge a little less for the food. Philadelphia has unusual and complicated drinking laws for a large city, mainly due to bureaucratic red tape over these very long standing laws and the tax revenue Pennsylvania collects from strict control over liquor sales. In recent years though, many PA residents have been strongly pushing for change or reform due to the unpopular inconvenience of the state run stores and that, even among locals, these laws are widely considered unprogressive and backwards compared to the liquor laws of most states across the nation. Because of the state's complicated liquor laws, supermarkets and privately owned stores cannot sell hard liquor, and only as of 2016/2017 have major stores such as Acme, Wegmans and Whole Foods been able to sell beer and wine, with a surprisingly large and varied selection. State-sponsored liquor stores are the only place to legally purchase liquor and spirits and are all over the place (though often have limited hours, especially on weekends) but they don't sell beer. Beer distributors do sell 6-packs although their prices are discounted towards encouraging larger purchases such as cases and kegs. The best way to buy beer-to-go in Philadelphia are from the many smaller stores and delis that in recent years have specialized in selling an extremely wide assortment of import and domestic beers, with a popular trend towards stocking lesser known craft beers, both local, national and export, as well as beers that are either seasonal or limited runs. One of the biggest reasons locals prefer buying from these stores is because most of them offer what's called a "mix-a-6", allowing for single bottles of different types of beer to be put together as variety 6-pack, and often given a small discount for doing so. This allows for sampling a wider selection of beers or just buying a couple different favorites. These stores are very popular, especially in Center City, Northern Liberties & Fishtown, South Philly and other surrounding neighborhoods, with well known places such as The Foodery and Food and Friends markets being go-to places for selection, "mix-a-6" and for staying open later into the evening compared to grocery stores. These stores have both helped to promote and grow, and benefited from, Philadelphia's visibly strong, public beer culture, celebrated in events such as the annual summertime Philly Beer Week  or the Philly Craft Beer Festival  in March. Local beers include Yuengling, Yards, PBC (Philadelphia Brewing Company), Sly Fox, Victory and Troegs, just to name a few. Many bars will have a varied selection of beers you already know and love alongside ones you've never heard of. If you're ever stuck on a choice but don't want to look out of place, just ask for a "lager", which in Philly specifically means the Yuengling Traditional Lager. Primarily, most of the nightlife scene takes place in Center City (West and East) and in Old City. The areas around Rittenhouse Square in Center City, and Headhouse Square and Penn's Landing in Old City, are popular destinations that have a large concentration of bars and clubs, many of them attracting the hip, young, pretty people of the suburbs or the universities. Slightly further out, the vacant warehouse turned gentrified neighborhood of Northern Liberties district is another solid nightlife destination with more of a "yuppie" vibe. Just further north and Philadelphia's version of Brooklyn, is the young, hipster neighborhood of Fishtown, The center of this neighborhood is conveniently located along the el train stop at Girard ave and Front street. There is a wide assortment of nightclubs, bars & restaurants, music venues, art galleries and many boutique stores ranging from high-end fashion, electronics, arts & crafts and "yard sale" type stores selling just about every kind of trinket to unique furniture and antiques you can imagine. Bounded by staunchly traditional ethnic neighborhoods to it's north, east and west, Fishtown has turned into a very popular location known for artists & musicians, people in the fashion industry, small business owners and dedicated community-minded, young new home owners who take pride in the eclectic neighborhood. On the other side of the city, in South Philly, is the East Passyunk Ave corridor (in that it is east of Broad street). This avenue stretches between neighborhoods, from Buena Vista/Queen Village at the northern end (around Passyunk ave & Christian st), to Broad & McKean streets at it's most southern end. It's epicenter is loosely between Dickinson and Moore streets, where the majority of stores, bars and restaurants are located. Along this single avenue is a large collection of bars and restaurants, clothes and record shops, delis and a large Acme grocery store and CVS, as well as multiple parks and gardens. Philly's famous Pat's & Geno's sit prominently along Passyunk ave at Reed street, an unmissable bright beacon for the late night bar crowds. Further towards it's northern and southern ends, the locations are further spread out and generally have a quieter, more neighborhoody type feel, especially just off the corridor to the east and west. Passyunk ave is notable in it's difference to Fishtown in that it still has many of the old, traditional South Philly restaurants and bars as well as multiple bodegas and "mom and pop" drug stores in the nearby blocks, that have been staples for the locals for generations. In addition, unlike Fishtown which pushed out or created it's own community, Passyunk ave has blended seamlessly with the long standing families and locals of south Philly, creating a rich and fun mixture of multiple generations of Italian, Hispanic and East Asian communities and families, and the newer, younger singles and couples just moving into the surrounding neighborhoods that are more affordable yet still "close to the action" of Passyunk ave and Broad street. Yet another area that has a vibrant nightlife, which is the Manayunk neighborhood . However, bars can be found in just about every corner of Philadelphia, and nothing is more characteristic of Philly than the local bar as a default place for social gathering; every neighborhood's got one or two just around the corner, even if it's a dark, run-down dive without proper signage and a crowd of blue-collar regulars, or a new-but-looks-old pub attracting the yuppies with outdoor seating and live music. Any major street or well-known district is going to have its own selection of watering holes, and each of these establishments will cater to a crowd, whether it's students, sports fans, hipsters or clubbers. In particular, streets and neighborhoods with a notable collection of drinking locales, not including Center City, Old City or Northern Liberties, include University City and West Philly; South Street and Passyunk Ave in South Philly; and the Art Museum District. In the summer, the Center City District sponsors Center City Sips , a downtown-wide Happy Hour every Wednesday from 5PM-7PM where many bars and restaurants all participate in drink specials: $3 beers, $4 wines, $5 cocktails, and half-price appetizers or other food specials. It's been said that Philadelphia invented, or at least popularized, the popular pub trivia event that is known here as Quizzo , which are called by other various names such as "quiz nights" by the time they expanded to other parts of the United States. Philadelphia native Patrick Hines first began running Quizzo games at the New Deck Tavern in University City in 1993 (though he spelled it with one 'z', as in "Quizo"), and began a second one at Fergie's Pub in Center City in 1995; there are now plenty of other bars running their own Quizzo nights throughout Philadelphia, and while Hines has moved to Ireland, he still writes the questions for several local bars. If you're able to find yourself in a game (you'll have to have a team and needlessly long and/or hilarious team name, or see if you can join one as a free agent) it's a fun way to spend a night, but be prepared to be completely left in the dust by trivia buffs who play regularly. Philadelphia Brewing Company produces a variety of beers. If you can't make it to the brewery (or find it in a bar) you can pick up a sampler pack (24 bottles) for around $30 at a beer distributor. Yard's Brewing produces a variety of beers, though notably Philadelphia Pale Ale, ESA (especially if you find this in cask format), and the ales of the revolution. Historically certified beers from recipes tied to Ben Franklin, Jefferson, and a porter named after Gen. Washington. Accessible via the Spring Garden Station on the Market Frankford el. Philadelphia is thoroughly covered by all of the major American cellular telephone companies. AT&T Wireless, Verizon Wireless, Sprint-Nextel Wireless, and T-Mobile Communications phones will all receive full service in most parts of the city. As always, service indoors varies according to signal strength, phone brand, and the composition of the building itself. AT&T has contracted with SEPTA to provide wireless service in transit tunnels. Wireless Philadelphia, a project that intended to cover the entire city with wireless internet access, is undergoing some management troubles. While the entire city is not yet covered, Rittenhouse Park, as well as many Starbucks and the ING Cafe at 17th and Walnut Sts., are hot spots. Reading Terminal Market also has free wifi. Jawn Something; any object, place or thing. Water Ice A dessert served by local restaurants that features flavored slushy ice. Sometimes called Italian Ice. Pop's, near the corners of Oregon Avenue and Broad Street, is arguably the most popular. Gravy This is tomato sauce, and is for the most part only used by those who are of Italian heritage. "Gravy" is usually prepared with meat including meatballs, sausage, and sometimes pork in order to give it flavor. Coffee Regular Coffee with cream and sugar. Jimmies Chocolate or rainbow colored candy sprinkled onto ice cream or cookies. Lager ubiquitous Yuengling Lager: lager produced by local brewery in Pottsville, PA. If you order "lager" in the bar that is what you're going to get. Philadelphia is frequently cited as one of the most dangerous cities in America. While the statistics are there to back this up, Philadelphia is a huge city, and violent crime is usually drug/gang related and situated in non-tourist areas of the city. The principle places that visitors are likely to see when they come to Philadelphia are, on a whole, extremely safe. While there are certainly parts of the city that struggle with crime, the chances that tourists will visit these areas are very very low. Still, it pays to be well-informed. Center City and its immediate surrounding neighborhoods in particular have low crime rates. Wealthier neighborhoods, like Rittenhouse Square, Old City and Society Hill, are safe, as are most central districts, including the Art Museum Area, Chinatown, the Parkway, Northern Liberties/Fishtown and Bella Vista. Some personal crimes (break-ins, muggings, burglary, assault) happen but much less often than the media suggest. All of these neighborhoods are safe to visit and explore. At night, Center City becomes a little more tense, especially east of City Hall (b/w Broad and 11th, and Arch/Walnut). There is a thriving homeless community in this area that can occasionally harass pedestrians, but there is little danger of actual crime. Chinatown bustling at all hours is a good testament to this. Other parts of the city still have issues with violent crime. Violence is generally concentrated in the north central, west, and southwest portions of the city, and unfortunately includes the areas surrounding Drexel and Temple (although the latter is considered worse). For Temple, while there is a bustling community and things to do, a good rule of thumb is to make sure you stay within 1-2 blocks of Broad St. Look for the blue security posts; if they're in sight, you're fine day or night. Riding the subway to Temple (Girard / Cecil B. Moore stops) is acceptable during daylight but not recommended after dark. For Drexel, most the crime is situated in Mantua, a neighborhood directly above campus, and to the west. While it may be tempting to walk from Drexel's campus to the Zoo, don't. This area is improving however, as many Drexel students have moved into Mantua and other far-flung reaches of Powelton Village to avoid the sky-high rent in University City. A good rule of thumb is, for Drexel's campus, to stay east of 40th St and below Spring Garden St. Powelton Village has many shops and restaurants and is mostly situated on Lancaster Ave, but walking too far west can put you in a completely different area. Both Temple and Drexel have their own police departments and maintain an active presence on campus 24/7. Still, violent crime does occur, and it's always best to be vigilant. Penn's campus is considered safer than Drexel and Temple, but the neighborhood to the south, Kingsessing, is a crime hotspot. Baltimore Ave is buzzing with student activity, and contains many funky restaurants and bars. However, it isn't recommended to go further west than 50th St. If you're adventurous, some of the city's best African restaurants can be found in Kingsessing -- but it's much better to take a cab than walk. South Philadelphia is for the most part very safe, with the exception of the area comprising the neighborhoods of Grey's Ferry and Point Breeze (bound by I-76 to the west, Greys Ferry / Washington Ave to the north, Broad to the east, and Passyunk to the south). Parts of this area are also improving, especially around Washington Ave, where hipsters have begun opening craft beer bars. 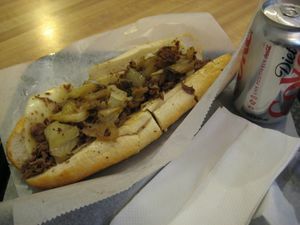 The other half (East of Broad) is much safer and contains the renowned Genos and Pats Steaks. For a good introduction to the Philly cheese steak, this is the place to go. Another worthwhile stop, is the Italian Market. North Philadelphia is an umbrella term for many working class neighborhoods in the north that are continuously struggling with crime, both violent and petty. Outside of Temple University and the MuralArts paintings, there is very little to see in North Philadelphia that would be of interest to tourists. However, in the "near north" (below Girard), Fairmount is a great neighborhood with a great diversity of residents, and is home to some of the city's best bars and restaurants. Brewerytown, located north of Fairmount and east of the Zoo, is gentrifying rapidly despite the area's crime and is becoming a safer (albeit more expensive) place to live. Fairmount Park also stretches to this area by the river; the park is very safe during the daytime and running along the Schuylkill on Kelly Drive is a rite of passage in Philly. East of Broad (yet still below Girard), it's more dicey until you reach 4th Street and the Northern Liberties neighborhood, which is extremely safe. Still east of that is Fishtown, the "Brooklyn" of Philly, and Kensington. Most of Fishtown is safe to walk around, and you'll discover incredible restaurants, bars, and shopping. In some points of Kensington surrounding Fishtown, you can find more bars and restaurants, but be very cautious and avoid any points near Kensington Avenue. Again, follow cues from locals, and if you find yourself in an area that doesn't feel right, turn around. Avoid far north neighborhoods like Strawberry Mansion, Fairhill, Stanton, etc. unless you are visiting someone who is very familiar with these areas. With a trusted companion who knows the neighborhoods, it's a great chance to see the Philadelphia not shown in the movies. Northeast Philadelphia has gotten more dangerous over the last few years, however the places where the majority of the crimes occur, there is nothing to see. The most outer parts (Somerton/Bustleton, Fox Chase) are some of the safest parts of the city and contain a few nice Eastern European restaurants. Pennypack Park makes for a great stroll during the day, however avoid it at night, regardless of the surrounding area. Holmesburg Prison and the Frankford Boat Launch are the only two other notable attractions, however take extra caution in these neighborhoods. Also, be careful of traffic when crossing at major intersections—-in Philadelphia, as in many major cities, one must always walk, cross, and drive defensively. The winding Schuylkill expressway provides some beautiful views, particularly around Boathouse Row, but do not try to enjoy them from your car; with the high speeds, the river on one side, and jagged rocks on the other, this is a sure way to cause an accident. Although it is blown out of proportion at times, Philadelphia sports fans have earned a reputation as a very passionate and notorious bunch. It is advised to be extra vigilant when attending a major sports match at the Sports Complex, particularly those who have the courage to wear the opposing team's gear in hostile territory. For these fans, it is best not to provoke the Philadelphia faithful and take their jabs in stride, as fans have been assaulted and even seriously injured in fights in and around the Sports Complex and around town. Allentown, Pennsylvania's third largest city. Home of Dorney Park. Hershey, home of Hershey Park. Lancaster, home of Pennsylvania Amish. The Jersey Shore, including Atlantic City, Cape May, Ocean City, and Wildwood. Visiting the Jersey shore is referred to locally as "going down the shore." Atlantic City is home to the Borgata, Caesar's, and several other casinos. Cape May offers historical tours (and haunted tours!) of the town. And hey, it's a great way to cool off and unwind—and perhaps work off that cheesesteak! Poconos and Endless Mountains, home to some ski and other mountain resorts. Langhorne, Home of Sesame Place. Approximately 30-45 minutes outside Philadelphia. Sesame Place is a one of a kind theme park aimed towards toddlers, pre-school, and grade school children. The theme of the park is based on all of the characters from the children's show Sesame Street. This park is as close to Disney World that the surrounding Philadelphia Area has to offer. The park includes wet and dry amusement rides, games, shopping, live shows, musical parades, restaurants, and meet and greet opportunities with Elmo, Oscar, Bert and Ernie, among other characters. .
King of Prussia, One of the largest indoor shopping malls in the United States with the most leasable retail space. It is a luxury mall with numerous upscale retailers. Lehigh Valley, region of eastern Pennsylvania north of Philadelphia. Princeton, home to Princeton University, in New Jersey. Valley Forge, historic site of American Revolutionary War. Washington Crossing, historic site of American Revolutionary War. Brandywine Creek, historic site of American Revolutionary War. York, historic site of American Revolutionary War. Gettysburg, historic site of American Civil War. New Hope, major shopping center north of Philadelphia. Reading, a city people sometimes go to. Home of Boscov's. This page was last edited on 6 April 2019, at 22:06.